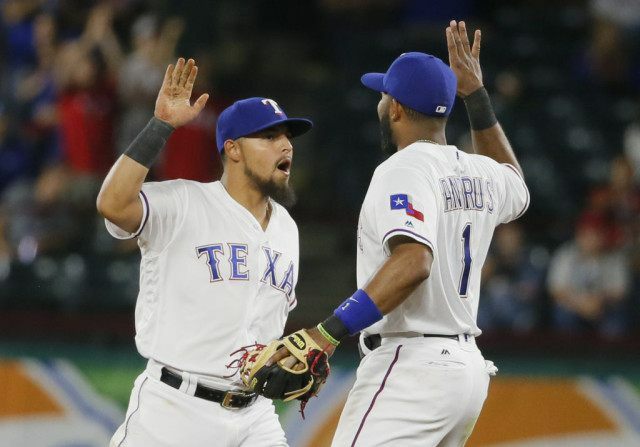 ARLINGTON, Texas (AP) — Rougned Odor had a tiebreaking two-run double as part of a Texas rally that preserved a career-best nine-game winning streak for ace Cole Hamels. The Rangers second baseman added yet another spectacular defensive play to help keep Texas in front. Odor’s double was part of a five-run sixth inning as the Rangers beat Baltimore 6-3 on Thursday night, handing the Orioles their second straight loss after a 7-0 start. “I think the key to the game is all the defensive plays they made,” Baltimore manager Buck Showalter said. Hamels struggled after retiring the first eight hitters and left facing a 3-1 deficit in the sixth. After Tom Wilhelmsen (1-0) kept the Rangers close by getting an inning-ending double play, five straight Texas hitters reached in the sixth against Baltimore starter Chris Tillman (1-1). Mark Trumbo hit his third homer for the Orioles, who were off to their best start since moving to Baltimore in 1954. The Texas bullpen threw 3 2/3 scoreless innings with big assists from Odor and third baseman Adrian Beltre. Odor snared Matt Wieters’ one-hop line drive that bounced a few feet in front of him to start an inning-ending double play for Sam Dyson in the eighth. Beltre threw out Jonathan Schoop from foul ground behind the bag for the second out in the ninth before closer Shawn Tolleson finished off his third save. “Just being able to have the type of defense we had today definitely saved a lot of runs in a sense,” Hamels said. The Rangers had four consecutive run-scoring hits in the sixth, starting with Mitch Moreland’s soaring bloop double that somehow landed near the foul line between left fielder Joey Rickard and shortstop J.J. Hardy. Ian Desmond followed by snapping an 0-for-16 slump with an infield flare, and Odor brought home two with an opposite-field drive into the left-field corner. Texas rookie Nomar Mazara continued his hot start with two hits, including a double that started the sixth-inning rally. Baltimore’s Manny Machado extended his season-opening hitting streak to nine games with a single in the seventh. Hamels, trying to join Yu Darvish as the only Texas pitchers in the past 11 seasons to win three straight starts to open the season, allowed seven hits and three runs in 5 1/3 innings. His regular-season winning streak goes back to last August, and he remained 6-0 in Arlington. He helped himself by escaping the fifth inning unscathed after putting runners at second and third with no outs. Rickard, the leadoff hitter, and Adam Jones struck out on either side of a groundout by Machado. “That’s why those guys are in such demand and the Rangers wanted him,” Showalter said. Pitching the night before his 28th birthday, Tillman was the victim of tough luck in the sixth after shaky baserunning by the Rangers helped him in the fifth. He gave up nine hits and six runs in 5 1/3 innings. Orioles: CF Jones returned after going six games without an at-bat because of a rib injury. He played the first two games of the season but had been used only as a defensive replacement twice since then. Rangers: Darvish said he’s “not quite there yet” in several aspects of his pitching as he closes in on a return from Tommy John surgery. On Wednesday, he had his first batting practice session since surgery in March 2015, reporting no problems but also saying cooler temperatures prevented him from getting completely loose. Orioles: RHP Vance Worley (0-0, 3.86) makes his second career start against Texas. He took the loss with Minnesota on April 25, 2013, giving up six hits and two runs in five innings. Rangers: LHP Martin Perez (0-1, 3.65) retired the first 14 hitters in his only start against Baltimore last season, getting the win in a 4-3 Texas victory. Steve Pearce ended Perez’s 41 1/3-inning homerless streak in a three-run fifth. This story is corrected to say Adam Jones went six straight games, not seven, without an at-bat.